I've been slowly making me some new friends. 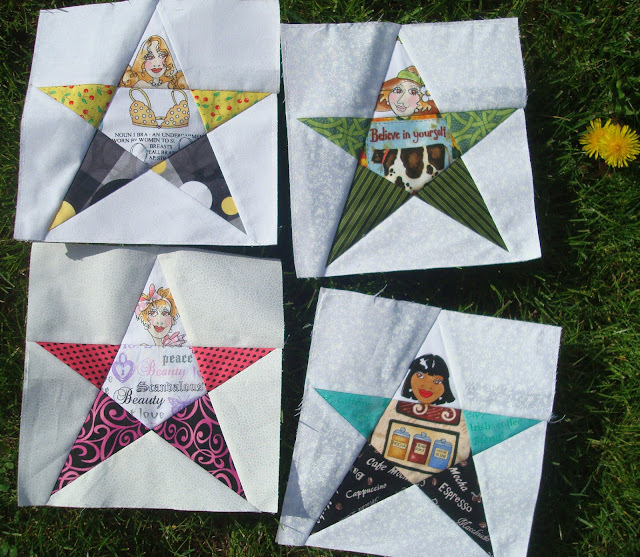 I made a couple more star girls to add to my Zetti quilt. I started calling it a zetti quilt in the beginning but wasn't sure how to go about creating the zetti's. I find this project morphing all the time and know am just referring to these girls as personality people. Remember this is a quilt I am putting together for a family member with a new degree in Psychology. But I am realizing I forgot to give these ladies...hands, shoes, hats. I think I was suppose to do that so do I use them or re-do them. Hmmm??? Not sure. In the meantime, I have been following Carrie Payne's work over at BelieveMagic . If you have never checked out her work you should as what she creates amazes me. 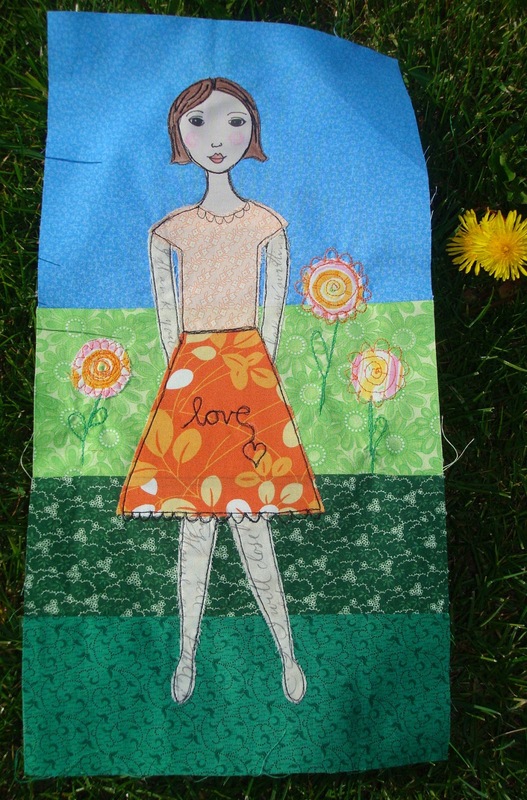 I recently bought a couple of her patterns at her etsy shop and they are sweet. The pattern not only had the pattern for making the creative girls she makes but the faces were printed on a piece of fabric in 3 sizes, 4 times each. Awesome!!! Totally not expected. She also threw in a complimentary package of buttons that are simply gorgeous. How sweet was that of her to include an extra goodie with my purchase. I just finished my first block with her creative girl featured on it. She makes these as art quilts and I certainly plan on making the quilt shop pattern of hers to hang in my quilting studio but I thought they might look nice in the center of these star girls. I want to make four of these for the center of the quilt. Oh yeah, she also included in the pattern the ruffle fabric needed to make this next girls dress. I have not outlined her in black stitching yet but check out her dress. 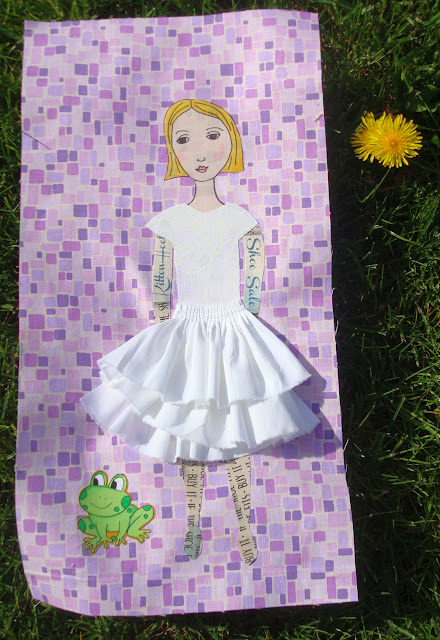 For now I am calling her my 'Take a Chance Girl' mainly because I think she should kiss the frog. She doesn't seem to sure about it but the frog looks eager. Maybe she has kissed one too many toads before. I love how Carrie put some words on some of them. On some she has put whole quotes but they are much larger and I want these girls to be just the center of the quilt not the whole thing. Be sure to check out Carrie's other works and I am sure she will have you wanting to Create. Imagine. Smile. I know that is what she is inspiring me to do. Your star girls are absolutely fabulous. Great idea! Thanks I like how they are turning out. It has been a slowly developing project but I might be onto something. Hey Teje did you know you are a no reply blogger?